If you have already read Part I of this report, please click here to go directly to Part II. Once a year, the International Energy Agency (IEA) releases its World Energy Outlook (WEO), and it's our tradition here at ChrisMartenson.com to review it. A lot of articles have already been written on the WEO 2010 report, and I don't wish to tread an already well-worn path, but the subject is just too important to leave relegate to a single week of attention. Because some people will only read the first two paragraphs, let me get a couple of conclusions out right up front. You need to pay close attention to Peak Oil, and you need to begin adjusting, because it has already happened. The first conclusion is mine; the second belongs to the IEA. Okay, it's not quite as simple as that; there are a few complexities involved that require us to dig a bit deeper and to be sure our terms and definitions are clear so that we are talking about the same things. But if we can simply distinguish between two types of "oil" (you'll see why that term is in quotes in a second), the story becomes much easier to follow. "Conventional oil" is the cheap and easy stuff. A well is drilled, pipe is inserted and oil comes up out of the ground that can be shipped directly to a refinery. Whether the oil is "sour" or "sweet" doesn't matter; it's still conventional oil. "Unconventional oil" refers to things like tar sands, ultra-deep-water oil, coal-to-liquids, oil shale, and natural gas liquids. In other words, oil that is much more difficult and expensive to produce. Crude oil output reaches an undulating plateau of around 68-69 mb/d by 2020, but never regains its all-time peak of 70 mb/d reached in 2006, while production of natural gas liquids (NGL) and unconventional oil grows quickly. I might quibble that the all-time peak remains 2005 in the US Energy Information Agency data set, but the main point here is that the IEA has not only used the words "Peak Oil" (finally!) but they've done so in the past tense, at least with regard to conventional oil. Assuming that this trend will continue, our prediction is that next year the estimate of future oil supplies will be ratcheted down one more notch. Perhaps by another 6 mbd, to match the difference between the 2009 and 2010 reports? First, pay close attention to the legend for the chart. Starting at the bottom, note that crude oil from "currently producing fields" (dark blue) is already in sharp decline and is expected to decline from a high of 70 mbd in 2006 to ~15 mbd in 2035; a loss of 55 mbd over 25 years, or 2.2 mbd per year. The next band up (gray) is crude oil from "fields yet to be developed," which we largely know about but have not yet really started producing significantly. My only comment here is that these fields cannot overcome the expected rate of loss in the dark blue band below them. All of the conventional oil that we know about is now past peak. In order to keep conventional oil flat, we have to move up to the third band (light blue), which goes by the spine tingling name "fields yet to be found" - which will apparently be delivering a very hefty 22 mbd by 2035. 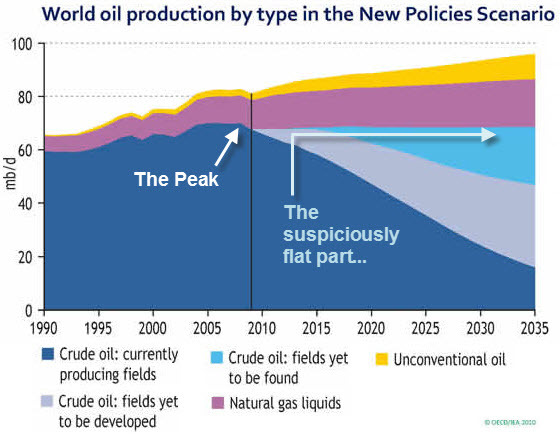 In other words, the IEA is projecting that in 25 years, more oil will be flowing from "fields yet to be found" than from all the fields ever found and put into production by the year 2010. Colin Campbell, one of the earliest analysts of peak oil who has decades of oil field experience, is on record as saying that the "fields yet to be developed" category, originally introduced to the world as unidentified Unconventional in 1998, is a "coded message for shortage" and was, off the record, confirmed as such by the IEA. That coded message is getting easier and clearer to receive by the day. But back to the main story line. Even if the final assessment of future oil production isn't notched down even one more tick, we have all the information we need to spot an enormous problem in the global story of growth. Assuming that we stick with the 99 mbd by 2035 estimate going forward, this represents a growth rate in oil of only around one-half of one percent (0.5%) per year between now and then. This means that over the next 25 years, the global economy will have to make do with less than half the rate of growth in oil that it enjoyed over the prior 25 years. How will the economy grow with less oil available? What will happen to the valuations of financial assets that explicitly assume that prior rates of growth stretch endlessly into the future? To cut to the chase, the admission by the IEA that we will not be achieving past levels of energy growth should be the most gigantic red flag in history, at least to those who might care that their money or other paper-based forms of wealth be worth something in the future. What if that future growth does not emerge? What happens when the collateral for a loan goes sour? The IEA report indicates an enormous set of risks for an over-leveraged world reliant on constant growth. The IEA now admits that conventional crude oil peaked in 2006. Permanently. Any gains from here are due to contributions from unconventional oil and natural gas-to-liquids. Under no scenario envisioned will future growth in fossil fuel supplies be equal prior rates of growth. Energy from here on out is going to be (much) more expensive. I cannot state this strongly enough: The WEO 2010 report is an official admission that Peak Oil is not only real, but it's already here. "Tomorrow�s [economic] expansion was collateral for today�s debt." The implications from this report are too important to preserve just for the enrolled members who support this site's mission, people, and goals. We're going to open up most of this report to the general public because we feel it's the right thing to do. For those unfamiliar with my work, the job I do most frequently is a combination of information scout (I connect dots) and analyst (I dig deep). 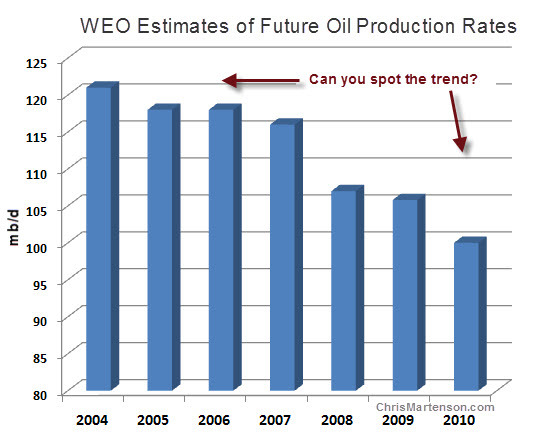 Okay, let's head deeper into the World Energy Outlook (WEO) 2010 report. Here's my quick summary of the report. Renewables will be contributing very little to the overall energy landscape, just 14% of the total, and this includes hydro. 93% of all the demand increase comes from non OECD countries (mainly China and India). Oil remains the dominant fuel (although diminishing in total percentage). The global economy will grow by an average of 3.2% per annum. It's time to cut demand for oil by raising prices (they recommend ending energy subsidies for fossil fuels as the mechanism). Conventional oil has peaked, and this is a permanent condition. All oil gains from here forwards will come from non-conventional sources and gas and coal-to-liquids programs. There are enormous implications to that series of bullet points, if one stops to think about them in total. One glaring difficulty in all of this is that the IEA notes that China and India are going to consume nearly every drop of any potential future increases in oil production. Yet overall production is only going to grow by a meager 0.5% per year. So how does the IEA suppose that oil growth can slow down to a paltry 0.5%/year, see China and India increase their consumption massively, and still have everything balance out? We all know that China and India (et al.) have been growing their oil consumption by massive percentages in the recent past, and there's some evidence that we can expect more of that behavior in the years to come. Premier Manmohan Singh told India's energy firms on Monday to scour the globe for fuel supplies as he warned the country's demand for fossil fuels was set to soar 40 percent over the next decade. So, yes, it's pretty much expected that China and India, et al., will be increasing their consumption by rates much (much) higher than 0.5%, which means, logically, that some other countries will have to consume at negative rates in order for the equation to balance. I want to draw your attention to the green circles that I placed on there. Yes, you are reading that right. To balance everything out, the IEA has modeled the OECD as actually decreasing its consumption of coal and oil by significant amounts (that's what a negative 'incremental demand' requires: a decrease in current consumption). The difference is made up from a mix of renewables, biomass, nuclear, and natural gas. Never has such a thing happened in the entire industrial history of the OECD. Never. There are no models or examples to follow here. No guidance is offered to suggest how such a monumental feat will be accomplished, beyond tossing a few more bucks at renewables, as if money alone could correct for vast differences in energy quantity and quality. 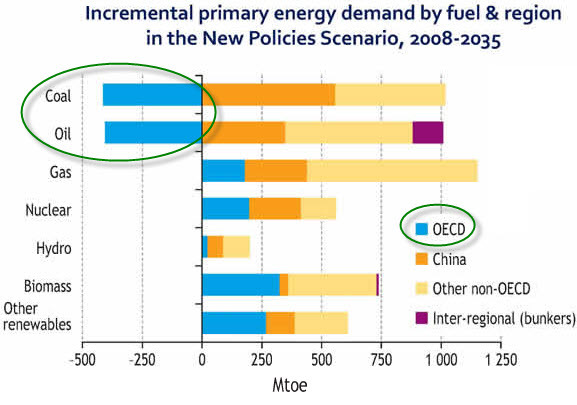 To suggest that the next 25 years for the OECD will be characterized by a significant reduction in the use of the two primary industrial fuels is an astonishing claim, and so it deserves to be carefully examined. But, speaking bluntly, this is not going to happen. Any suggestion that the OECD is going to reduce its use of coal for electricity and oil for liquid fuels has to be accompanied by evidence of massive programs of investment towards energy transitioning that, truth be told, have to have been started a decade or more before the arrival of Peak Oil. Hinting that it might possibly be a good idea to move these renewable dreams to the drawing board after the advent of Peak Oil is akin to playing tunes on a sinking ship; at best, you are providing a captivating diversion. Regardless, no such programs operating at appropriate scale are even remotely in sight. A point that I try to make clear in my upcoming book (due out in March 2011 from Wiley) is that such an energy transition would be evident by such things as the trillions of dollars being dedicated to it, by eminent domain actions to secure new land for natural gas pipelines, and by vehicles that could run on electricity or natural gas being churned out by the millions. While we can debate whether we might get there someday, there can be no doubt that we are not there today. So if one is a card-carrying member of the mainstream media, what does one do with such a major event as the WEO 2010 report? In the case of the New York Times, the answer is to run a completely schizophrenic pair of articles, but bury the supportive one deep in the "blogs" section while placing the one that completely ignores the WEO 2010 report prominently in the business section. Is �Peak Oil� Behind Us? That�s the conclusion of the International Energy Agency, the Paris-based organization that provides energy analysis to 28 industrialized nations. According to a projection in the agency�s latest annual report, released last week, production of conventional crude oil � the black liquid stuff that rigs pump out of the ground � probably topped out for good in 2006, at about 70 million barrels a day. Production from currently producing oil fields will drop sharply in coming decades, the report suggests. That's pretty accurate. You'd think that such a stunning admission by the preeminent body responsible for preparing such reports for the OECD would have sparked a fury of investigation and maybe even self-investigation by the New York Times, which through the years has pooh-poohed the entire idea of Peak Oil rather religiously. But that didn't happen. Just as it seemed that the world was running on fumes, giant oil fields were discovered off the coasts of Brazil and Africa, and Canadian oil sands projects expanded so fast, they now provide North America with more oil than Saudi Arabia. In addition, the United States has increased domestic oil production for the first time in a generation. Seriously, any country or corporation that cannot foresee the end of cheap and abundant oil is being run by dangerous people. To suggest that even the most optimistic assessment of oil, which has it peaking in 2030, is too far away to begin planning for today is just silly. Really, now...responsible planners considering major capital projects with multi-decade life spans (which can be 30 years or more for many things) should just ignore energy? That's the message here? Goodness, gracious. In fact, there are so many problems with "There Will Be Fuel" that I hardly know where to turn to next. I suppose we could note that the article quoted "100 years of natural gas" left in the US without mentioning the all-important phrase "at current rates of consumption." To those who are familiar with exponential processes, and who know that energy consumption has been increasing exponentially for decades, such an oversight is an enormous red flag. It betrays either ignorance or deception on somebody's part (perhaps the editor? ), and neither are acceptable at this stage of the energy debate. Once we increase consumption at reasonable and prior rates, that 100 years can rapidly shrink to mere decades in a hurry. What's the difference between "100 years of gas" and "maybe a couple of decades"? Night and day. Next, we might note that the article goes out of its way to make the case that "estimates for how much oil there is in the world continue to increase," while somehow avoiding the essential point that it's not the amounts that matter, but the rates at which the oil can be coaxed to flow out of the ground. Peak Oil is, has been, and always will be about flow rates, not amounts. For example, if the very center of the earth were entirely filled with oil, but we could only get to it through a single, very thin tube (limiting how fast we could pull the oil out), it wouldn't really matter how much was there - a hundred trillion barrels could be there - because how much we could do with it would be limited by the rate of extraction. Exponential economic growth requires increases in fuel consumption. It always has and it always will, until and unless a brand new model of economics is developed. Again, the lack of awareness of this basic concept of the difference between rates and amounts leaves the New York Times piece very much in doubt. I could go on, but it's not all that helpful to once again catch the New York Times playing fast and loose with the facts in order to advance an agenda; for now, let's just observe that Peak Oil refers to a condition where the rate of extraction cannot be increased. If it were about amounts, then I suppose we would call it "Peak Reserves," but it's not, and for a reason: We care about the flow rates. It is on this matter of flow rates that the IEA report was especially jarring and succinct: Peak Oil has happened. At this point, it may be good to remind ourselves that last year an IEA whistleblower said that the organization had willfully underplayed looming shortages due to political pressures from the US. The allegations raise serious questions about the accuracy of the organisation's latest World Energy Outlook on oil demand and supply to be published tomorrow � which is used by the British and many other governments to help guide their wider energy and climate change policies. The idea expressed above is simple enough: The oil data has been fudged to the upside by the IEA. Pressure has allegedly been applied upon the IEA to paint a rosier picture than a strict interpretation of the data would warrant. To speculate, the reason why is that there are a host of interlocking vested interests in the financial but especially political spheres that would find the public recognition of Peak Oil to be disruptive and therefore unwelcome. This is just another example of Fuzzy Numbers, but the consequences of fibbing to ourselves about oil are far more dire than when we lie about employment. If it weren't so serious, it would be just another somewhat regrettable obfuscation of reality created to serve narrow and temporal political purposes. Note: There is a well-recorded history, going back at least 13 years, of the IEA being fully aware of Peak Oil but bowing to political pressure to soften the message. Read paragraphs 4 & 5 of this piece by Colin Campbell for some more essential background. The IEA has known about looming Peak Oil issues for more than a decade and is only now explicitly recognizing the idea in their public documents. People inside and outside of the IEA say that the organization has downplayed both the timing and potential severity of Peak Oil. Peak Conventional Oil has already happened. Any possible growth in future oil that the IEA can envision -- and we might suspect that even this is fudged to the upside and will retreat in subsequent reports -- is going to be almost entirely eaten up by China and India. What this means is very, very simple. There will be an energy crisis in the near future that will make anything we've experienced so far seem like a pleasant memory. The very best personal investments you can make at this stage will involve increasing your energy resilience. Make your house require less heating and cooling, use the sun wherever and whenever possible, and increase your personal storage of the fuels you use (if and when possible). The potential knock-on effects of less energy to the complex system known as our economy are unpredictable in their exact details and timing, but are thoroughly knowable via their broad, topographical outlines. The economy will become simpler and less ordered. In Part III of this report, we explore the the answer to: "What should the investor (individual, institutional, private equity, or hedge fund) do next with this information?". Click here to access Part III (free executive summary; paid enrollment required to access).